Bananas don’t last long in our apartment. The few times I half-heartedly trying to get some ripen, they inevitably got gobbled up quickly. This time though, a simple request with an offer of a reward does the trick. The initial intention was to make a simple banana cake but since F asked so nicely to incorporate chocolate chips in it, he got it! This is an old recipe from my tattered notebook, so I can’t even remember where I may have got this in the first place. I was drawn to it for its simplicity (that seems to be how I like all recipes to be!) and that I usually have all the ingredients in the pantry, except the ripe bananas. I prefer using demerara sugar in this cake for its rich caramel note, but if you don’t have it on hand, brown or white sugar would do as substitutes. Maybe reduce the quantity a little, so the cake doesn’t end up too sweet, especially if the bananas are already of sweeter variety! You can also jazz it up with chocolate chips or chopped nuts. 1. Preheat the oven to 170°C, and line a loaf pan. 3. Combine the wet ingredients in another mixing bowl. 4. Fold the wet ingredients to the dry ingredients, and mix till just combined. 5. Add in the chocolate chips or chopped nuts, if used. 6. Pour into the loaf pan and place thin slices of bananas over the top. 7. Bake for 50-60 minutes, till golden and skewer is clean. 8. Leave to cool a little before removing from the loaf pan. 9. Slice the cake and enjoy the treat! To be honest, I’m not a very precise baker. This is why I usually work with cups and spoons instead of precise grams and millilitres. I also improvise with the optional extras. When I don’t have chocolate chips, I just chop cooking chocolate bars and make my own version of variable-sized chocolate chips. I also estimate the amount of chips or nuts, depending on the texture of the batter, which in turn may vary given the amount of smushed bananas used. Those sliced bananas on top is not necessary at all, but they do pretty up the cake a good bit! Thanks for typing up the recipe, Lil! I’ve procured some chocolate chips and have set aside some bananas (they disappear in our house too), and now I’m waiting for them to be perfectly ripe. I’m trying to get some ripen at the moment too, so I can rebake for friends arriving tomorrow! Still no chocolate chips so I ought to get some later today. Happy baking! I love banana cake. 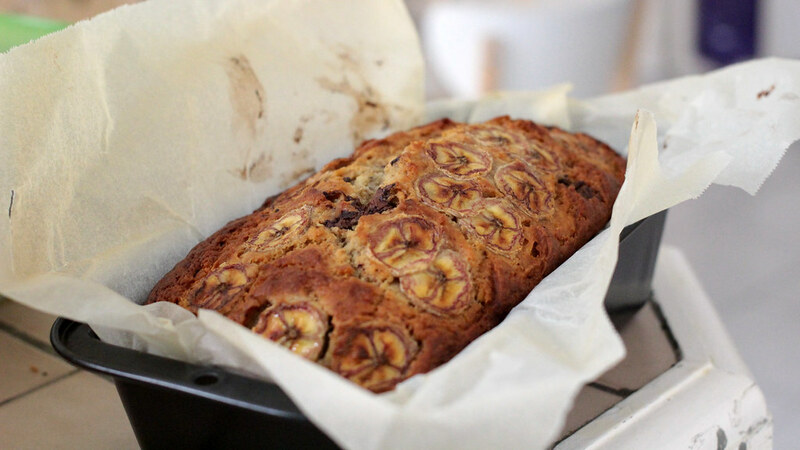 If you have ripe bananas but you want to keep them for when you have time to make the cake, freeze them! I don’t think this pretty cake would last long in my house too. Looks pretty amazing!